If you need to replace missing teeth dental implants are the most popular and industry standard treatment option within dentistry today. Dental implants offer benefits for your: Health, Wallet, Lifestyle, and Smile. No other treatment method of replacing missing teeth compares to them! Learn more about their benefits below from Phoenix Periodontist, Dr. Ariel Trujillo, and see how dental implants can change your life completely! Compared To Dental Bridges, Dentures, Or Other Tooth Replacement Methods, Dental Implants Look & Feel Natural. They Act Like Real Teeth! If you have lost a tooth and decide to let your tooth socket remain empty, it can be dangerous to your oral health for multiple reasons. First, without proper stimulation from a tooth, the jawbone in that section of your mouth will start to deteriorate. The blood capillaries that had surrounded your tooth will begin to fade and that area of the jaw will start to receive fewer nutrients. This causes your jaw to become weaker and brittle. This weak jaw bone compromises your other teeth, which potentially can start lead to you losing even more teeth! Deciding to fill the empty space left by your tooth with a dental implant will stimulate new bone growth and help maintain your jawbone's strength. Dental implants will assist in preserving and strengtheing your jaw, and ensure your other teeth stay healthy. Your natural teeth will gain additional support by your new dental implant. They then have less of a chance to be lost or damaged. When you have an empty space in your mouth for a long period of time your natural teeth begin to shift, filling the gaps left behind. They also begin to deteriorate even more from foods that take more work to digest. Unfortunately, other mouth restoration procedures like dentures and dental bridges can alter your teeth in a negative way causing additional damage and pain. With dental implants in place, you can keep your other teeth as they are. They won’t shift to fill in the empty space that otherwise would have been left by your missing teeth. The reason why is that dental implants act just like your normal teeth, and it will feel like you haven't even lost a tooth at all! When dental implants are placed by a trained periodontist, like Dr. Trujillo, and are cared for properly, a they are are a one-time purchase. They'll last a lifetime! Other tooth replacement techniques, like dentures mentioned above, often last less than a decade. With dentures you will eventually have to come back to your dentist to make adjustments and replace them. It's unfortunate that you have to replace your tooth replacements that you already had invested so much money and time. Not only are alternative treatments ineffective, they can be very costly over your lifetime. When compared to other methods, dental implants are the most durable with a very high success rate! When properly maintained, it's very unlikely they will ever have to be repaired or replaced. 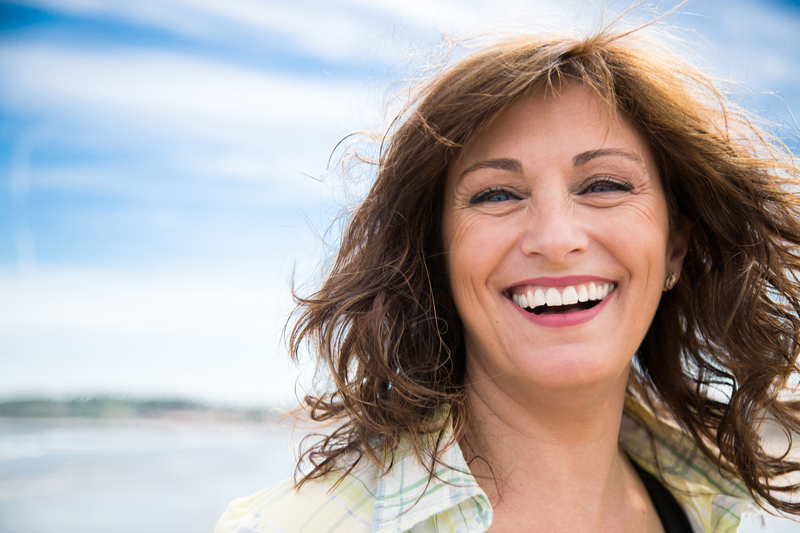 Compared to bridges, dentures, and other tooth replacement methods, dental implants look and feel natural, and blend in with your natural teeth. Most people will never have any idea that you have a dental implant. Not only do they blend in well with your other teeth, but they also maintain your face and mouth shape as we had mentioned. With missing teeth, your cheeks start to sag into the spaces left behind. This causes a shrunken, wrinkled, almost skeletal appearance. This is another reason why you should choose dental implants as they will perfectly fill those empty spaces left by your missing once did. They help keep your face looking normal and youthful. Finally, dental implants don’t just look natural, but they function like your teeth. It is simple and easy to take care of your dental implants; maintain your normal oral hygiene habits - brushing and flossing your normal teeth - and your dental implants will function perfectly. And because dental implants are fixed in your mouth permanently, you don’t have to worry about them falling out when you sip a drink or bite into an apple like you would with dentures. You can eat what you want since your new dental implants aren’t going anywhere. You can forget the list of foods you couldn’t enjoy before your dental implants completely! Also, don’t be surprised if you forget which of your teeth are natural and which ones are the implants. Dental implants feel and look so natural that it is effortless to adjust to them. You will be able to smile and speak easily, with no lisp, just as you always did before your teeth were damaged or lost. WHY GET DENTAL IMPLANTS FROM ARIZONA PERIODONTAL GROUP? If you are considering dental implants and are looking for an exceptional dentist in Phoenix, Arizona, schedule an appointment with Arizona Periodontal Group. While other dentists practice dental hygiene and try to fit in dental implants on the side, Dr Trujillo has additional training as a periodontist which means he has more experience that can give you peace of mind. You can rely on expert care and recovery with minimal discomfort during the entire procedure. Now is the time to restore your lifestyle, and change your life! Schedule an appointment with us today to look into dental implants!